Happy Birthday School Food Matters & ISS Education! By ISS Education on June 21, 2017 in Our blog! On the 15th June ISS Education took part in a very special birthday picnic. School Food Matters (SFM), invited children from 50 London schools to come to Westminster for a celebration in the beautiful College Gardens at Westminster Abbey. SFM were celebrating their 10th birthday, and as luck would have it ISS Education turned ten this year too, so it was a double celebration! To help SFM celebrate the occasion, ISS Education set up several activities to entertain the young guests. Food Ambassadors Mark Worsdell, Hassane Taleb and Adrian Coey manned the smoothie bike stand, where children raced to blend fruit and vegetables into tasty drinks. 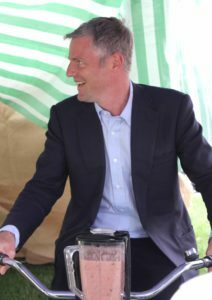 Even Westminster MP Zac Goldsmith couldn’t resist having a spin! Nutritionist Charlotte Quick and Food Ambassador Freda McCarthy tested everyone’s knowledge at our Guess the Exotic Fruit stand, whilst giving advice on proper portion sizes and the importance of a varied and nutritious diet. Our friends at food supplier NCB came along too. They ran a wonderful Farmer’s Market stand, where a localfarmer discussed the different varieties of vegetables he grows and offered tasters. 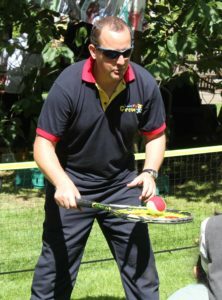 We were also joined by Nino Severino and his team at Live, Learn, Grow who put the children through their paces with an exercise workshop. They taught attendees a fun parachute game, played with beanbags, tap sticks and silk scarfs showing how they can put some fun into their fitness experience. After warming up, Nino taught the children some tennis skills, passing on the expertise from his career as a professional tennis player and coach. SFM also invited along representatives from Whole Foods and Borough Market who had the children whipping up healthy snacks and delicious salads. Garden Organic showed the groups how to plant seeds and Chris Collins helped them make glorious hanging baskets with strawberry and tomato plants! The day concluded with chef Tom Aikens judging the best picnic dish, as submitted by each school. Then all 500 attendeesparticipated in a big carrot crunch – everyone simultaneously took a big bite from a raw carrot creating an almighty crunch! 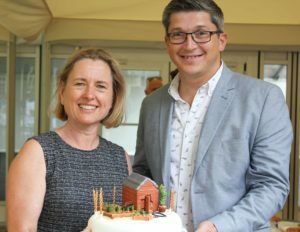 Mark Davies, Managing Director of ISS Education, then presented Stephanie Wood, SFM founder and CEO, with a spectacular allotment cake, made by our very own Stephen Finch, in honour of our shared birthday. SFM have played a vital role in the development of the School Food Plan and Universal Infant Free School Meals, as well as partnering with ISS Education to make our Food Growing Grants possible and many other school food campaigns. We couldn’t think of a better way to mark our tenth birthday. To learn more about School Food Matters click here.